Our Future Network is part of artist Alex Martinis Roe’s To Become Two series, which traces her long-term research into the genealogy of ‘feminist new materialist’ and ‘sexual difference’ theories through an engagement with different international feminist communities and their political practices. The films are presented in a modular architectural installation designed with Fotini Lazaridou-Hatzigoga. Our Future Network is distinct in the series in that it uses the knowledge gathered and produced in the other five films to develop new collective practices with the network of people brought together for the larger To Become Two project. 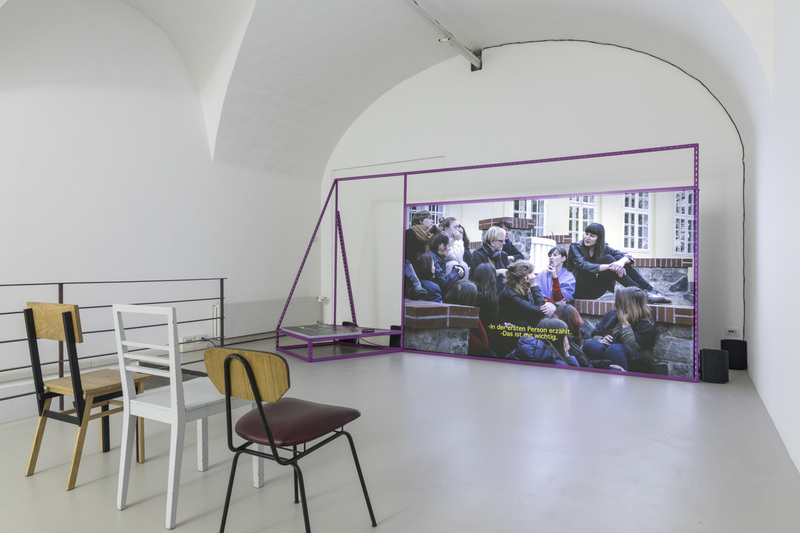 A feature length film, which documents a four day meeting of the 22 contributors in a country house outside Berlin, the work involves the enactment of 20 “propositions for feminist collective practice”, each of which was developed in collaboration between the contributors and the artist in the months leading up to the meeting. The artist asked each participant: what can we learn from the political, theoretical and aesthetic practices developed within and among the historical feminist collectives in the To Become Two project? And how can we adapt these practices to our own needs, desires and contexts? In the context of Shapes of Knowledge Martinis Roe's film shares these propositions with the gallery audience while also acting as a toolbox to be used during workshops and performance events held during the exhibition with a group of local participants. In these workshops individuals devise their own propositions for engagement which are finally presented in a public forum where the local chapter of Our Future Network will be distributed. Alex Martinis Roe’s current projects focus on feminist genealogies and seek to foster specific and productive relations between different generations as a way of participating in the construction of feminist histories and futures. This involves developing research and storytelling methodologies that employ non-linear understandings of time, respond to the specific practices of different communities, experiment with the dispositives of discursive encounter, and imagine how these entanglements can inform new political practices. Recent exhibitions include Yvonne Lambert, Berlin; Haus der Kulturen der Welt, Berlin; Hessel Museum of Art, New York; Rongwrong, Amsterdam; Archive Kabinett, Berlin; Australian Centre for Contemporary Art, Melbourne; Artspace, Sydney; Pallas Projects, Dublin; and FormContent, London. She holds a PhD in Fine Arts from Monash University, Australia (2010), and was awarded the Silver Jubilee Scholarship for post-graduate research (2006-9). Alex Martinis Roe is currently Senior Lecturer and Head of Sculpture and Spatial Practice at the Australian National University, School of Art and Design. Alex Martinis Roe’s Our Future Network film project was funded by the Graduiertenschule der Universität der Künste Berlin, The Einstein Stiftung, Berlin and the Australian Government through its arts funding and advisory body, the Australia Council for the Arts. Her broader To Become Two project was co-commissioned by If I Can’t Dance, I Don’t Want To Be Part Of Your Revolution (Amsterdam); ar/ge kunst (Bolzano); Casco – Office for Art, Design and Theory (Utrecht); and The Showroom (London). The Our Future Network workshop and salon series was supported by The Keir Foundation. Alex Martinis Roe's project has been supported by the MUMA Contemporaries.